Sometimes you just want a steak. On our recent trip to New York City, Carol and I wanted to go someplace nice but not over the top to celebrate our tenth anniversary since we started dating. A quick search of OpenTable showed that the Saturday night slots at most places were really starting to fill up, but we noticed that the Financial District location of Brasserie Les Halles had decent availability, so we decided to give it a go. 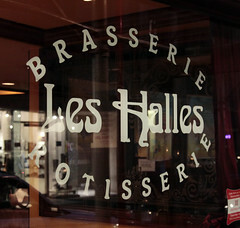 Les Halles has been on my hit list for a while, mostly since I love bistro food, French-style butchering, and good fries. And, admittedly, Bourdain’s plugging of the place made me curious. The location itself is a little bit of an interesting story. Located at 15 John Street, it’s a stone’s throw from the WTC site, and is one of the few operating businesses on that stretch of John Street. A lot of the other businesses relocated, and their storefronts are currently used as locker rooms and union halls for the WTC workers. Les Halles Downtown opened several months after 9/11, so it’s definitely a case of optimism in the neighborhood’s future, but it does give the place an odd ambiance, especially since the storefront is wrapped in scaffolding that appears to have been there for a long time, and doesn’t appear to be leaving any time soon. The restaurant itself is your basic bistro, with a large bar in front, a dining room in back, and all sorts of white-tablecloth little tables crammed in slightly more tightly than most people are comfortable with . The ambiance is slightly dark, with the lighting, mirrors, and the obligatory brass fixtures offsetting the darkness a bit. I ended up starting with a salad. Prior to showing up at Les Halles, I had been craving a wedge salad. You know, where they take a quarter of an iceberg lettuce, and basically drown it in bacon, bleu cheese, and ranch dressing. Well, the don’t have that at Les Halles. 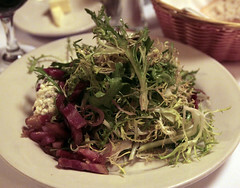 What they have is much, much better: Frisee aux lardons. Frisee lettuce in a light bacony sauce, served with plentiful chunks of perfectly fried bacon and a nice roquefort crouton. It was everything I was looking for in a salad, some nice crunchy but slightly bitter greens, plentiful but not overwhleming bacon-ness, and a good cheese note. For my main course, I ended up going with the onglet, or “hanger steak” for the non-French crowd. I was happy that Les Halles actually listed the translation as “Hanger Steak”, since I’ve been to entirely too many places that incorrectly call it “Hangar Steak”, as if I’m looking for a place to park my airplane or Zeppelin. The onglet (along with it’s nearby cousin, the bavette) is one of my favorite steaks, although it’s one that’s easy to screw up. If not butchered properly it can be stringy or gristly, and if overcooked it picks up the same sort of funky gaminess that kidney sometimes has. 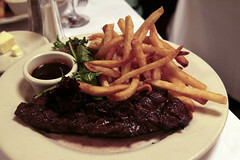 The onglet with served with a shallot reduction sauce, a small mesclun salad, and frites. The onglet was nicely butchered, and cooked a perfect medium rare, with nice pink interior, and just a slight crisp to the edges of the meat. The shallot sauce complemented it nicely, but the frites were the real action. I’m definitely a fry snob, having actually had what I consider to be the perfect fries from several little street vendors in Amsterdam and Brussels. These frites were very well done, with a nice soft, moist, mealy interior, a crisp exterior, and just enough caramelization to add a bit of flavor. A solid 9/10 on my fry scale, making this a solid entree (and at $19, not a bad price at all). For dessert, I discovered that Carol had never had Crêpes Suzettes. Now she has, and enjoyed the show. I’ve had better Suzettes, but these were good enough, and half of the idea of Crêpes Suzettes is the show (the other half is butter. Lots of butter.). 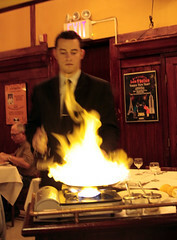 All-in-all, we really enjoyed Les Halles. The reviews of Les Halles have been mixed (especially for John St location), but for what it is (moderately-high-end Bistro food), they did well. Maybe not up to the hype, but it’s definitely on my “visit again” list. Highly recommend the mac and cheese here. One of the best I've ever had!